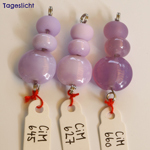 511645 - BUY NOW All Messy Colors available at: ..... crea-arte gmbh (, Switzerland) ..... Ed Hoy's International (IL, USA) ..... Frantz Art Glass (WA, USA) ..... Tuffnell Glass (East Yorkshire, United Kingdom) Most Messy Colors available at: ..... ABR Imagery, Inc. (IN, USA) ..... AniBeads (, Germany) ..... Artisens Studio (, Hong Kong) ..... Artistry In Glass (Ontario, Canada) ..... Artyco (, Netherlands) ..... Bead Glass (NSW, Australia) ..... beadbox.de (, Germany) ..... Beadpress (, Netherlands) ..... BerlinBeads (, Germany) ..... Flamedame.com (FL, USA) ..... Glasgestaltung (, Germany) ..... Glasperlenkunst / La Casita Bolita (, Switzerland) ..... Glassworks France (, France) ..... Howaco Glass Supply Co. (MI, USA) ..... InsideColors (, Russia) ..... L'Age du Verre (, France) ..... Moretti & More (WA, USA) ..... Neus Shop GmbH (, Switzerland) ..... Nortel Manufacturing Ltd. (Ontario, Canada) ..... Ombos Arts & Beads & Crafts (, Germany) ..... 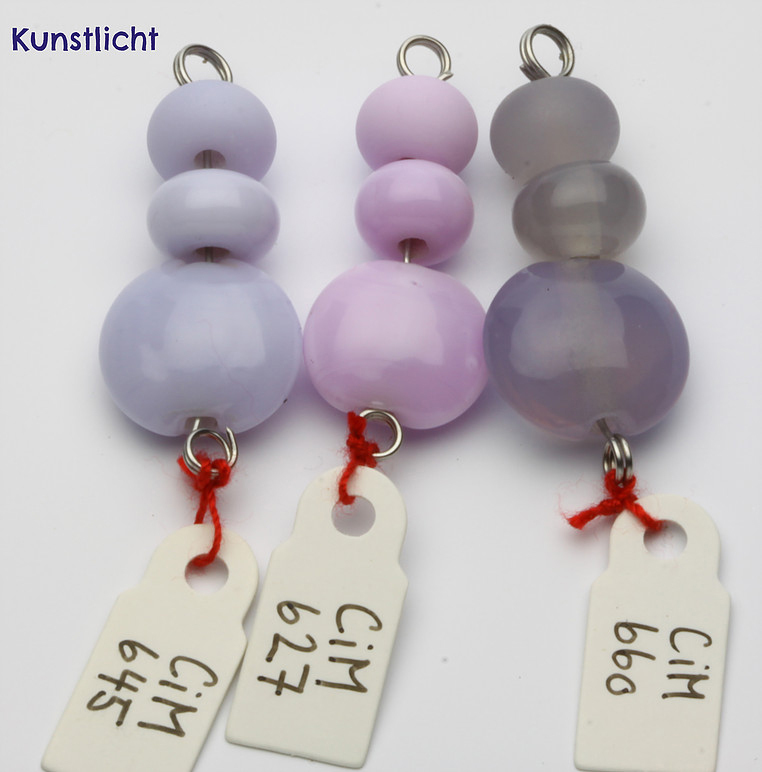 Studio 34 Creative Arts Learning Center (NY, USA) ..... ООО «АРТ-ЛЭМПВОРК» (, Russia) Visit our complete reseller listing. 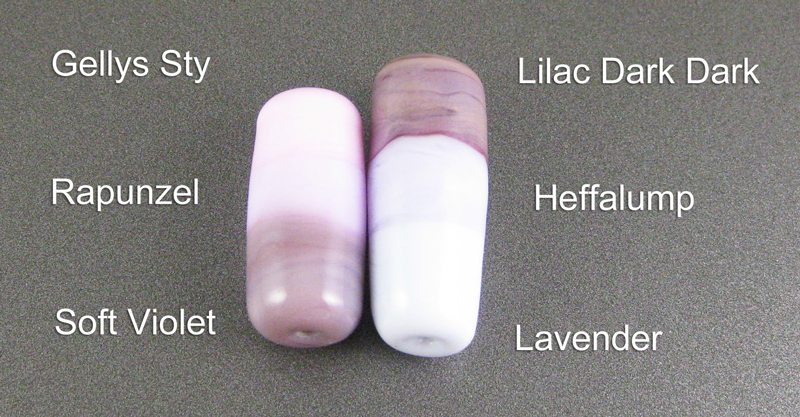 Click here for other interesting Heffalump discoveries. 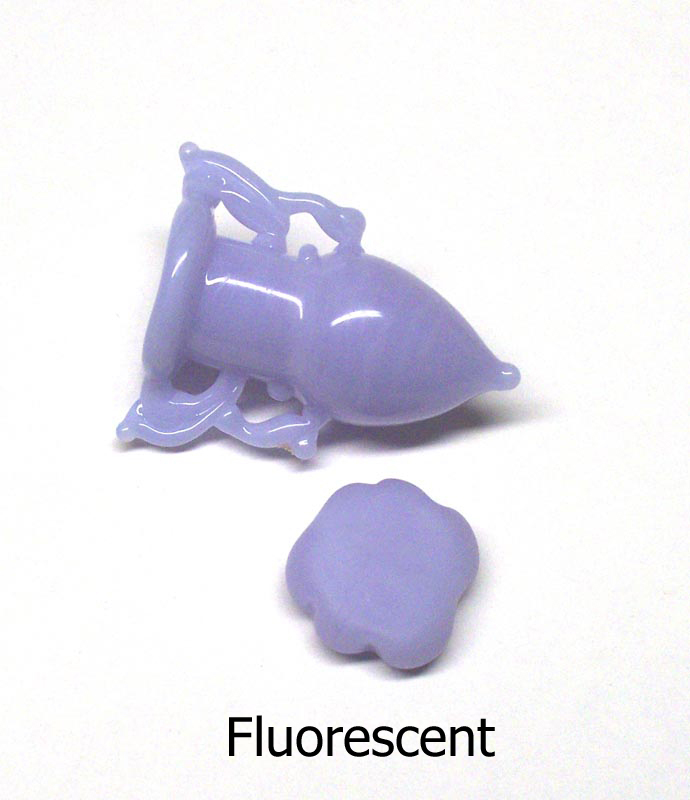 Testers report that Heffalump shifts in color depending on the type of lighting. 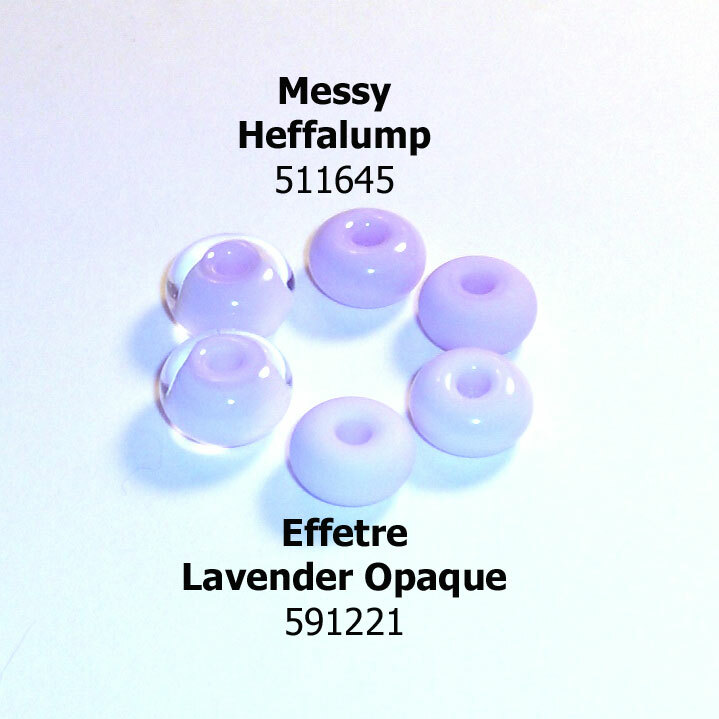 Heffalump is unique to the 104 lampworking palette. 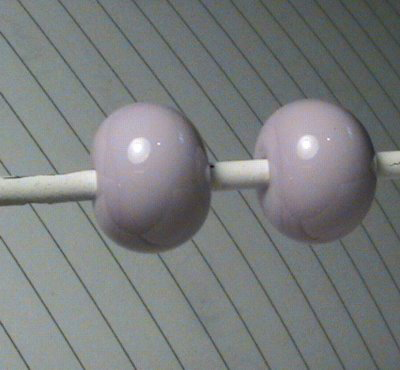 Testers report that Heffalump rods often look different from batch to batch, but once worked they are a consistent hue. 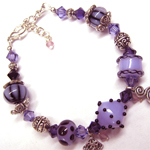 Special thanks to Elasia, Genea Crivello-Knable, Bethany Lemasters, & Melanie Graham for providing the photos in this section. 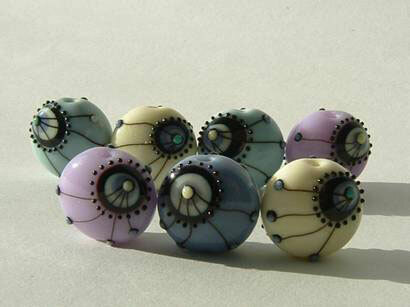 Darlene Collette encased Heffalump with Effetre Pale Blue. 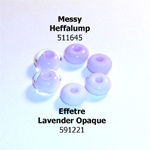 Darlene Collette encased Heffalump with Effetre Light Purple. 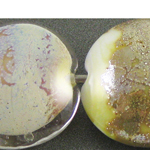 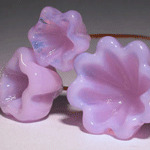 Take a look at how Amy Houston made spacers with fine clear “sugar” frit on Heffalump. 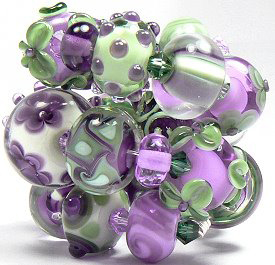 Amy Houston made a series of purple spacers with Heffalump. 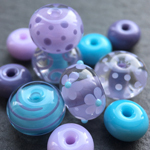 Laura Sparling made purple polka dot beads with Heffalump. 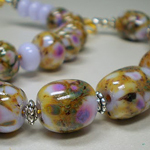 Check out Amy Houston's froggie focal made with Heffalump & Thai Orchid. 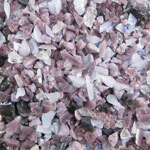 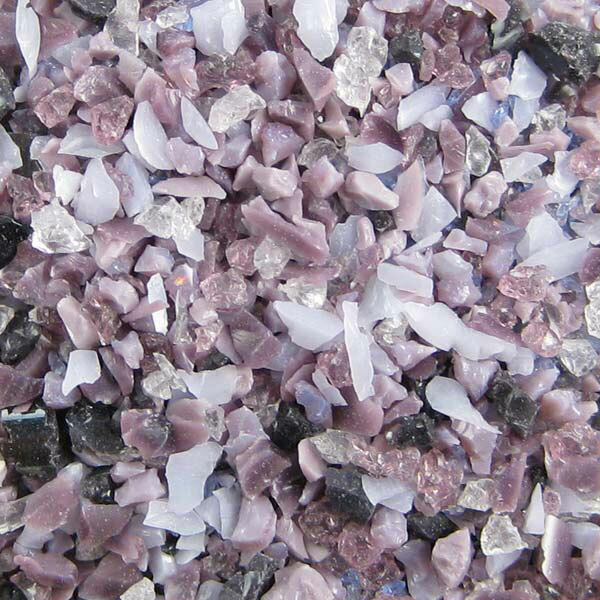 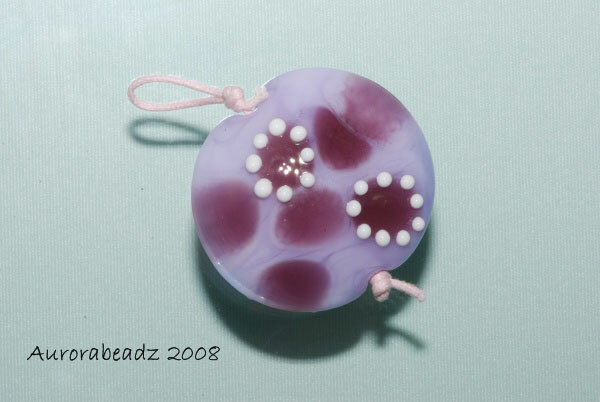 Amy Houston used Heffalump as a base for fuschia & silver lake frit. 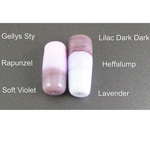 Genea Crivello-Knable did a color study of Heffalump with various other colors. 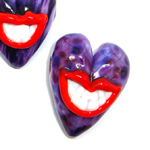 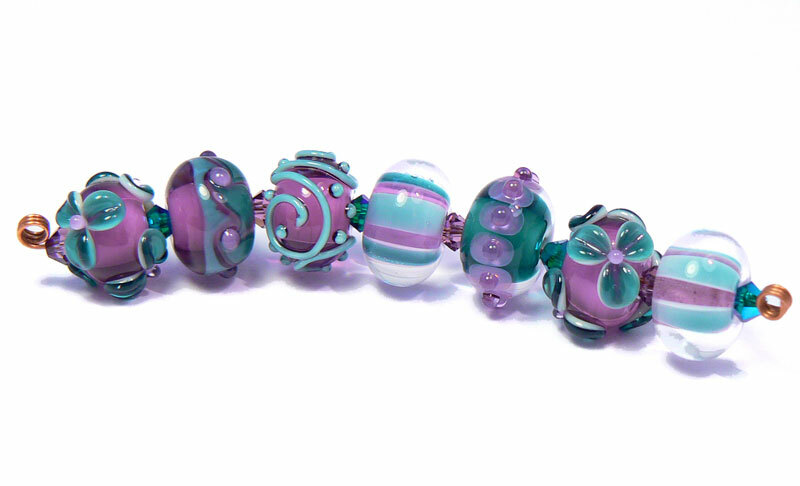 Check out Kanna Glass Studio's blog on her "juicy little glass berries" made with Heffalump. 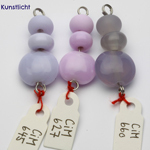 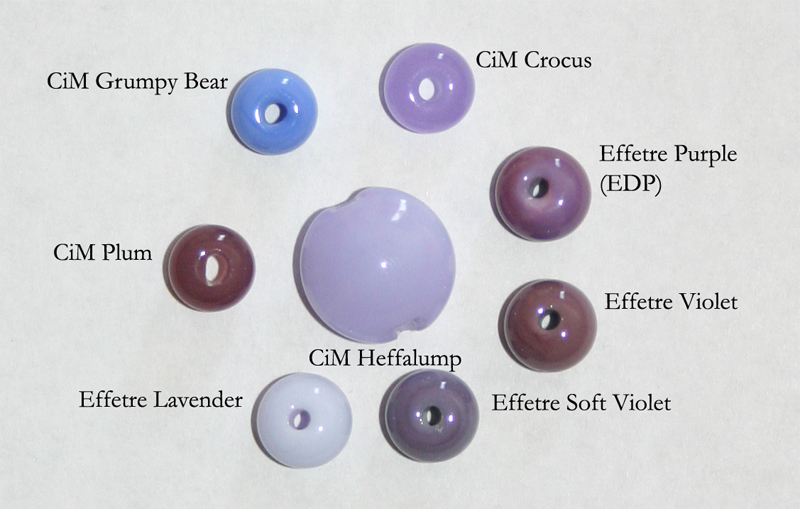 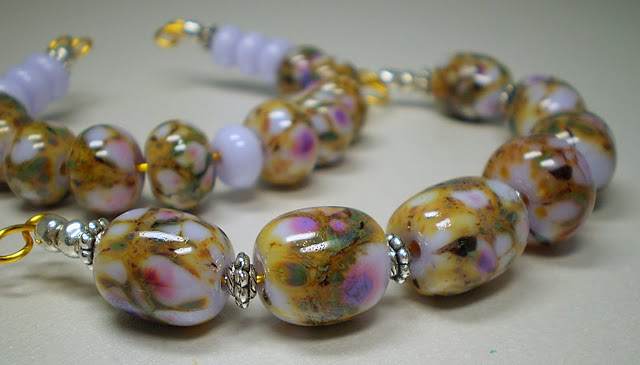 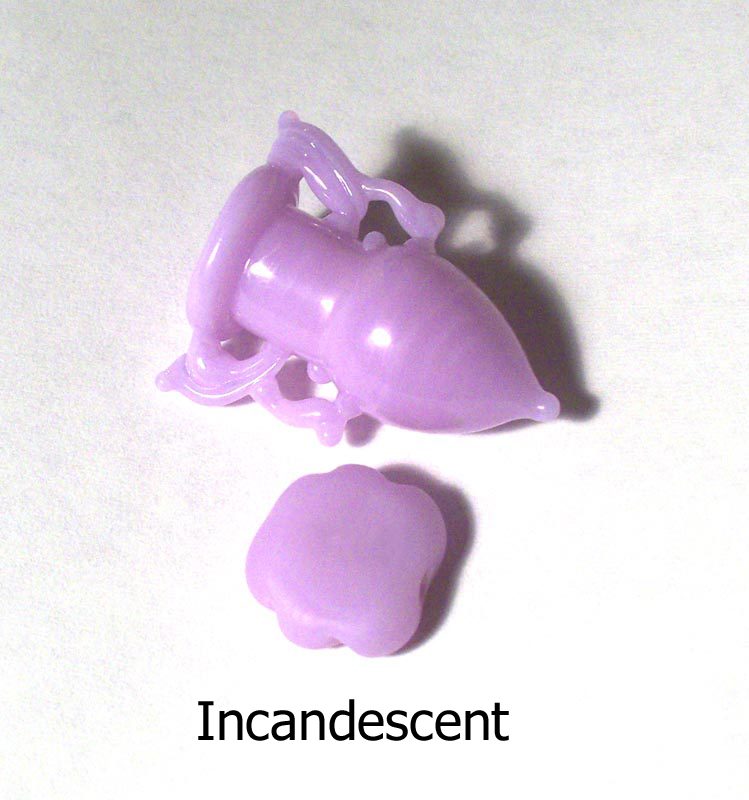 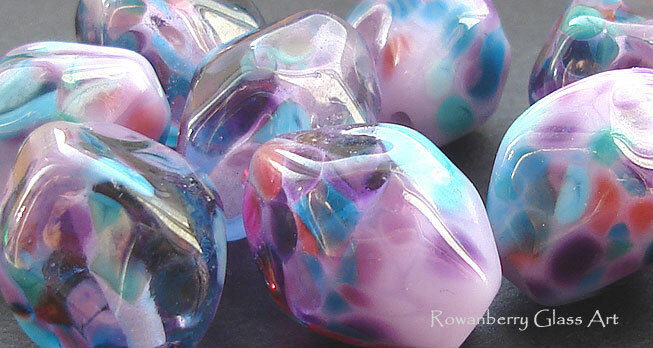 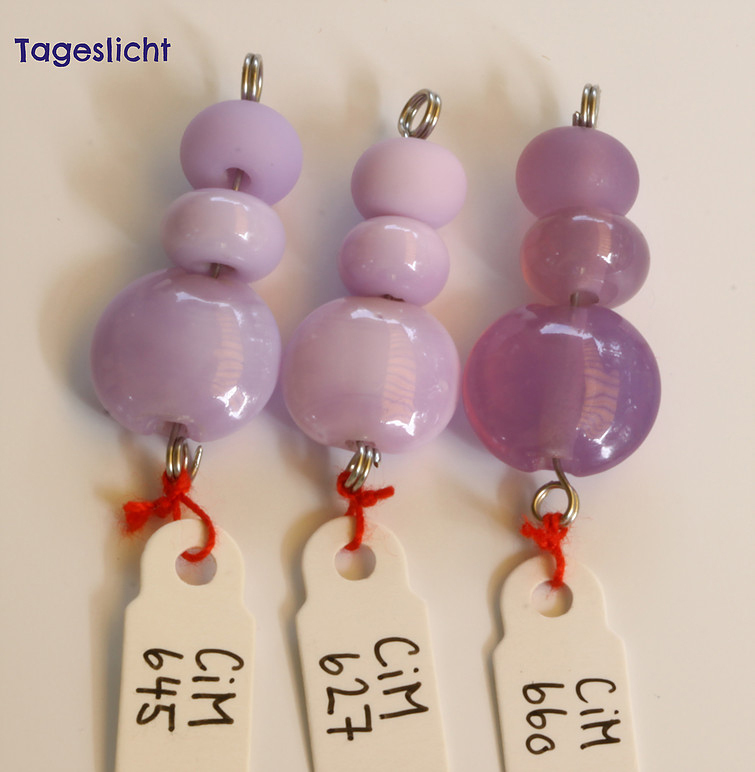 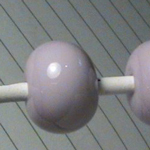 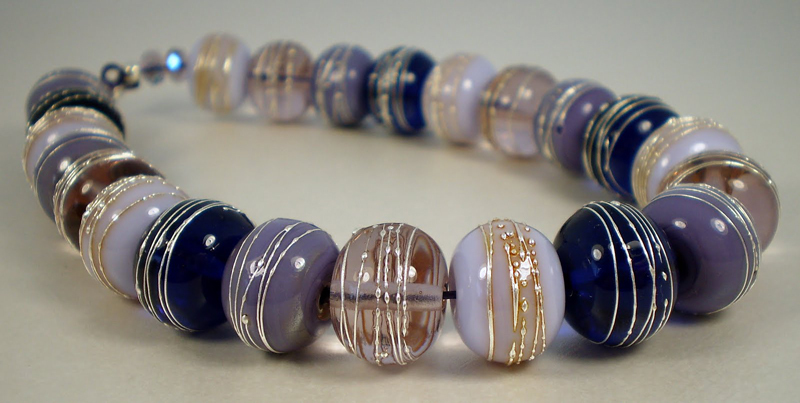 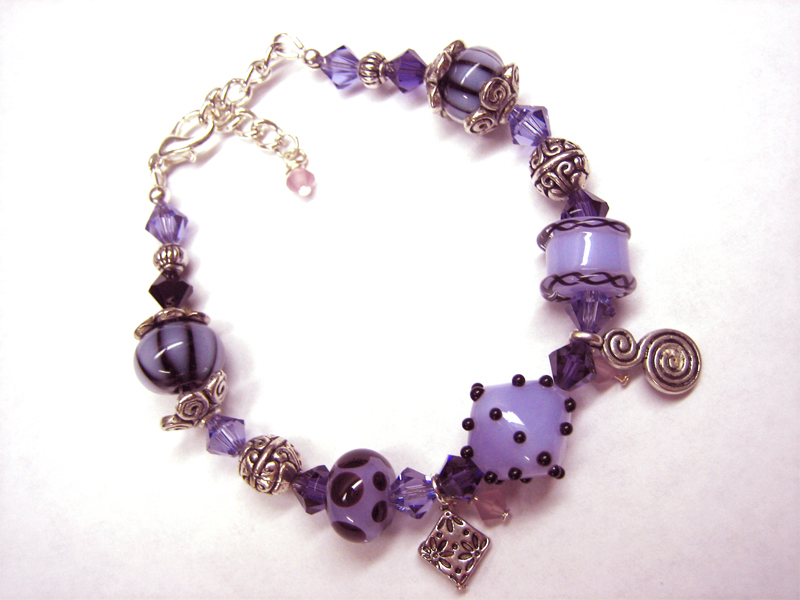 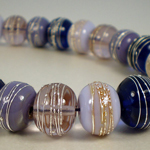 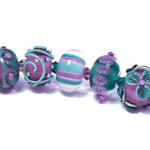 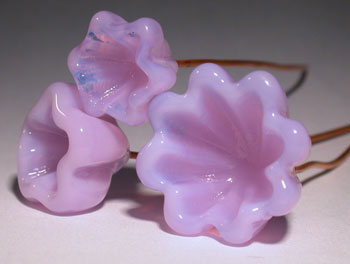 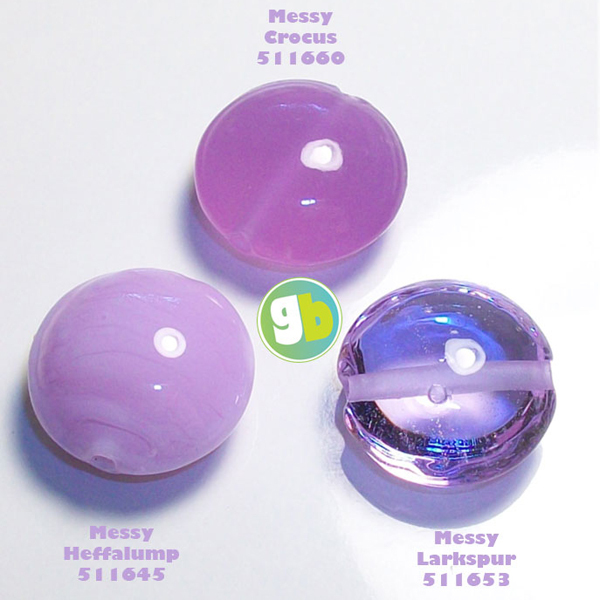 Genea Crivello-Knable made test beads to compare Heffalump to Effetre opaque lavender blue. 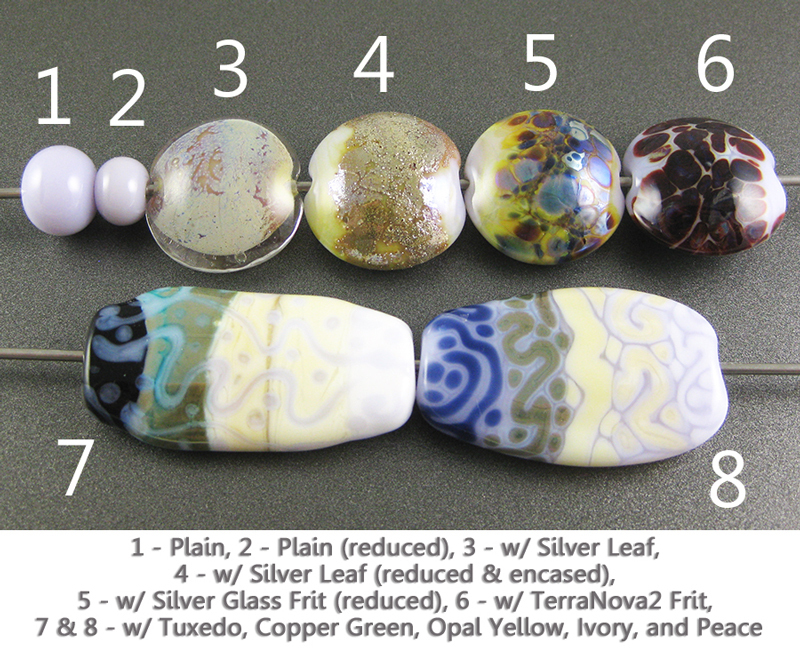 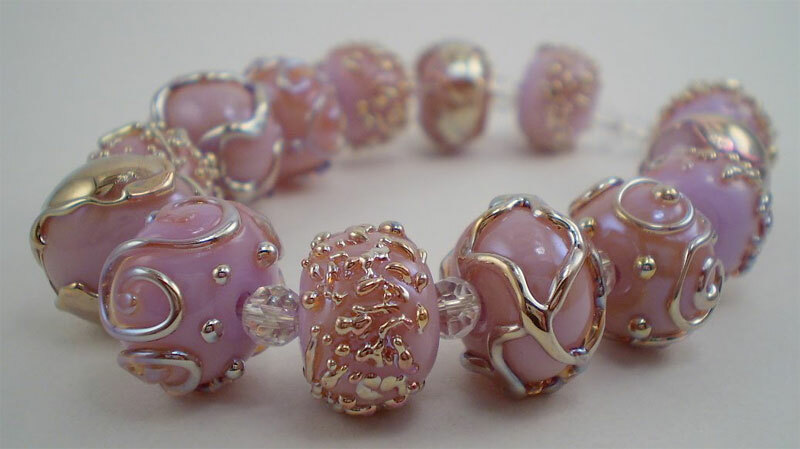 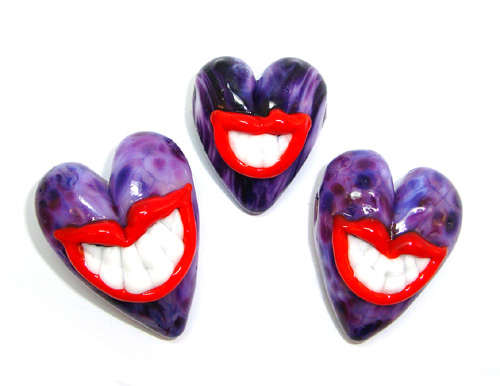 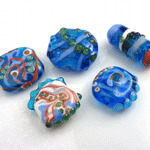 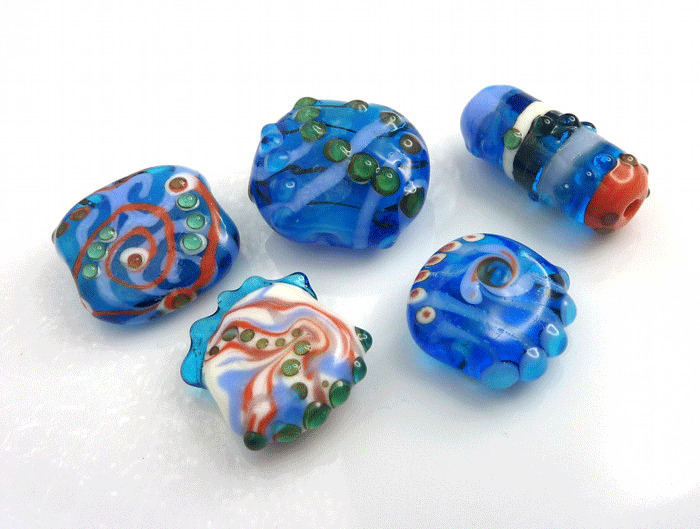 See Kandice Seeber’s bead set made with Heffalump that reminds her of her mom.